With the festive and wedding season just around the corner, we are sure you are looking for some special Silk sarees. This is why we shall take you on a journey to the East Godavari district of Andhra Pradesh to explore the world-famous Uppada Sarees! Uppada is a special type of weaving technique, which adds a natural shine and smoothness to the fabric. These sarees are a perfect example of the south meets west, with their use of the famous Jamdani weave. This is why Uppada saris are also called Uppada Jamdani. That’s not all! There are many more interesting facts about these beautiful drapes along with some latest Uppada sarees collection, just for you! Uppada sarees occupy a significant position in the Indian silk industry. Unlike the heavy Kanjeevarams, Uppada sarees are extremely light-weight, yet durable. They are characterised by the iconic Jamdani technique, where “Jam” means flower and “Dani” means Vase. This is why the designs of Uppada sarees feature floral and nature-inspired patterns, which are drawn from their Persian roots. They are quite expensive due to their labour intense process and high-quality silk and Zari threads. Uppada sarees are completely handwoven and use non-mechanical weaving procedures. Silver and Zari threads are used a lot in making of these sarees, which gives them a rich shine. Authentic Uppada sarees have a 100×100 thread count to offer better strength and durability. Each saree takes about 10-16 days to weave, depending on the intricacies involved. They are available in a wide variety of colours, from the traditional reds and greens to the modern-day pastels. 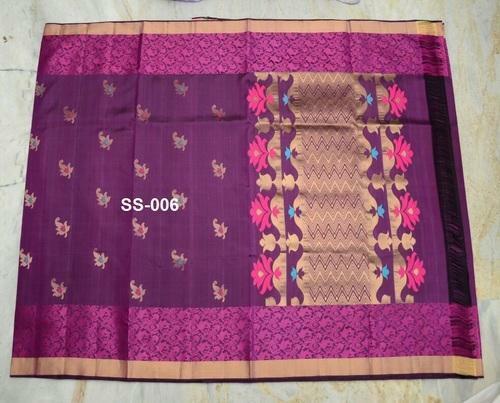 Uppada sarees are quite pricey, and starts from six thousand. Uppada sarees are a number one choice with women of all age groups. Due to their airy and light feel, even elderly women prefer wearing these sarees, over the heavy Benaras or Kanchi sarees. They offer delicate patterns, which can be worn even by young women to almost all occasions. This is one of the best Uppada sarees that you will ever come through. It has got the looks and the material to make a woman look amazing. The pattern that this saree sports on the front and the sides are also worth mentioning and it will be suitable for you as well. If you are willing to look your best, then this is something that you will allow you to achieve what you want. Here is another beautiful Uppada sari that will be suitable for all women out there. The pattern that this saree follows is so intricate that it can be said to be extremely suitable for almost all occasions and events. Even when you are thinking of wearing the most beautiful Indian saree right now, then this will be something that will always pop up on your mind and eventually you will end up wearing it. This is such an Uppada sari that all women out there will think of sporting on their body. It comes with a beautiful patch like designed patterns on the lower portion and to the extreme end of the sides, that is the borders. The saree has been made to make women look good in it and it is something you will love carrying on your body as well. Here is an Uppada sari that sports more than one color and it will make you look quite alluring as well. The saree comes with the application of more than one colors and it will make you look very alluring instantly. The patterns done on the border portion is one of the most attractive features of this saree and that is the same pattern that makes it look impressive in the first place. 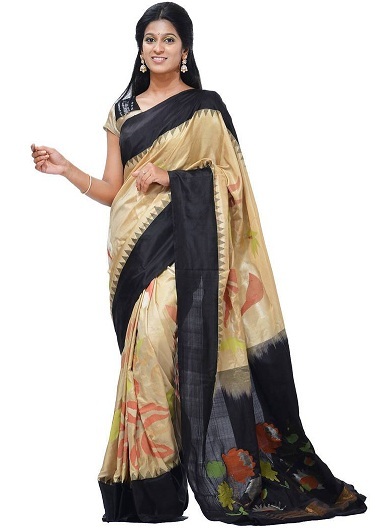 Here is a beautifully colored cream saree that comes with the mixture of the color black as well. This is something that impress people instantly. The design comes with an alluring pattern done on it and it will impress people as well. Both the colors suit the saree so perfectly that any will easily make up her mind to wear this saree. Here, we have two colors beige cream and pink done beautifully on the saree. The model is so awesome that it can be displayed with a half sleeve blouse. zari plain occupy the border portion and that is what will persuade all the women to sport this on their body. 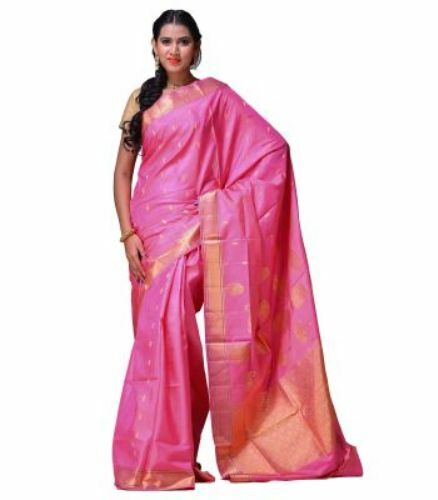 The pink color is one of the finest attractive features of this saree and that is what makes this saree so special in the first place. Here is something that you will find alluring for yourself. 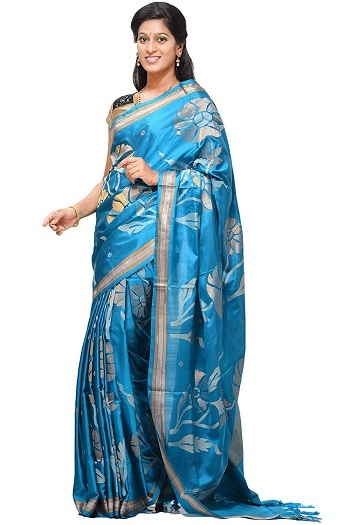 The blue colored saree comes with some intricate patterns done in the middle. The borders are decorated with a different type of color and it is probably one of the finest Indian sarees of all time that can make a woman interested in this designer material. It is not too fancy and not too simple as well. It is rather, perfect for attraction attention of the mass audience. The edges are beautifully decorated with strap-like patterns and the lower pally portions also shows some sign of the color pink which takes this saree to a different league of beauty. So one thing you can sure of that is it will attract people’s attention and looks instantly. Like all the other Uppada saree this is an also a pretty light saree and can be worn as a casual saree. If you are looking for something alluring, then this can be the right one for you. 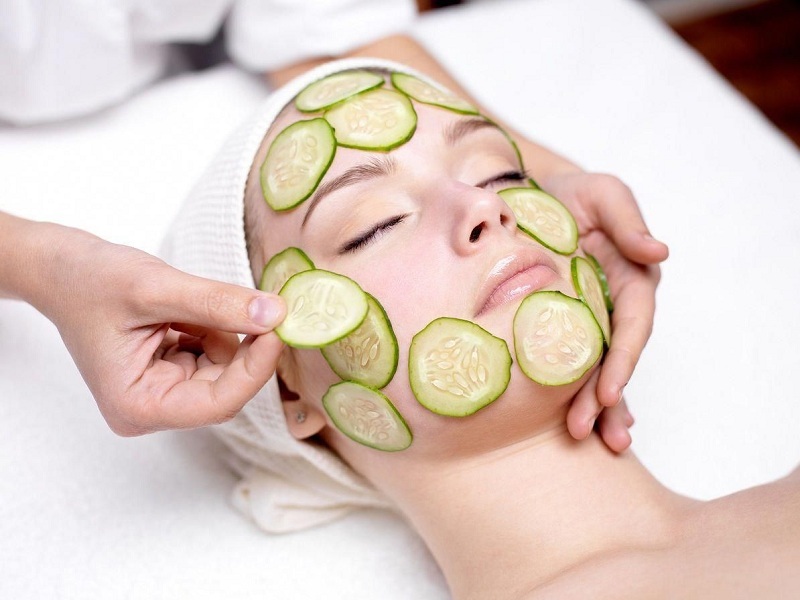 It will suit all your needs and make you look attractive to the core. The delicate patterns done on this saree is what attracts people in the first place. If you are looking for something revolutionary in the ethnic Indian clothing category, then this is the right thing for you. Here is a designer saree for all women out there. It is something that will be appropriate for young as well as mature women. It can be used as a casual wear saree. One can also sport them at indoor events. Because of its featherweight feature, it is extremely comfortable. Here is saree for all the women who want to look their best by sporting the Indian clothing style. The smart and delicate designs on the front part and the back part form the real deal and that is the feature that makes it so alluring. Here is something that can prove to be extremely attractive to you. The awesome floral pattern of this saree makes it look alluring and it is something that all women will want to sport on their body for a special occasion. Here is a saree that will be suitable for all women who want to look their best by what they are supposed to wear actually. It is something that you haven’t seen before. Rest assured, it is extremely attractive and can get the job done of impressing people quite effectively. 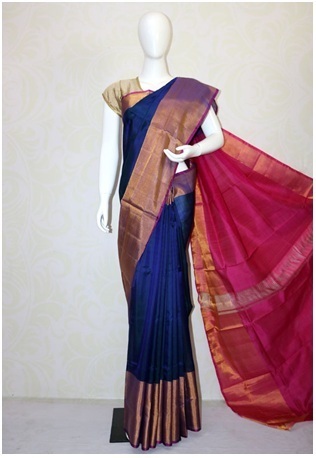 Here is a Uppada sari that sports two of the best colors for sarees most effectively. Golden being the base color along with some black stripes is something that will make people go crazy for this saree. If you are looking for something trendy with a classic touch, then this will be the right stuff for you. Here is a red Uppada saree that comes with some intricate patterns done on the body. It is not too fancy that it cannot be worn to simple places. Again it is not too dull that it will hamper your image at aristocratic parties. It is flexible and kind of suits itself and makes itself eligible for the situation. This is again a really light saree (Uppada sari) that will be accurate for women with a fair skin tone. 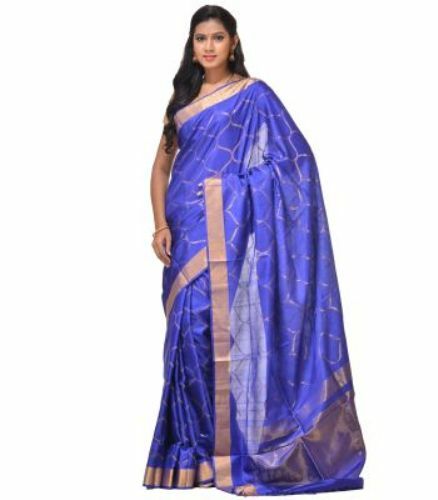 It will make you look extremely attractive from the heart and make you look like the most wonderful woman in the crowd of all the saree wearers. 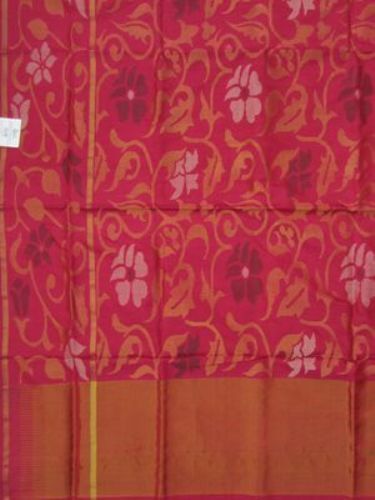 Here is a beautiful-looking Uppada saree that comes with a pretty good floral Buta pattern done on this saree. The Buta patterns on the Pallu and the bottom is what makes it look so attractive in the first place. The saree is something that will suit almost everyone’s needs. After a long time, here is an alluring silk saree with a pretty good design done on the borders. Like some of the best sarees out there, it is made to impress, and one thing is for sure that women will be impressed by looking at for once, especially because of the color. If you are looking for an alluring saree this season, then this can work well for you. 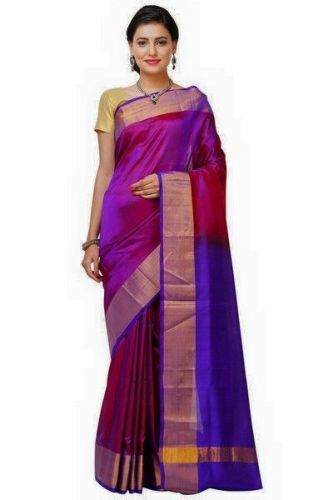 Here is a beautiful silk saree for all women out there. Though it is a silk saree, it is not too heavy to carry. You can pretty comfortably carry it and make it look good on you. 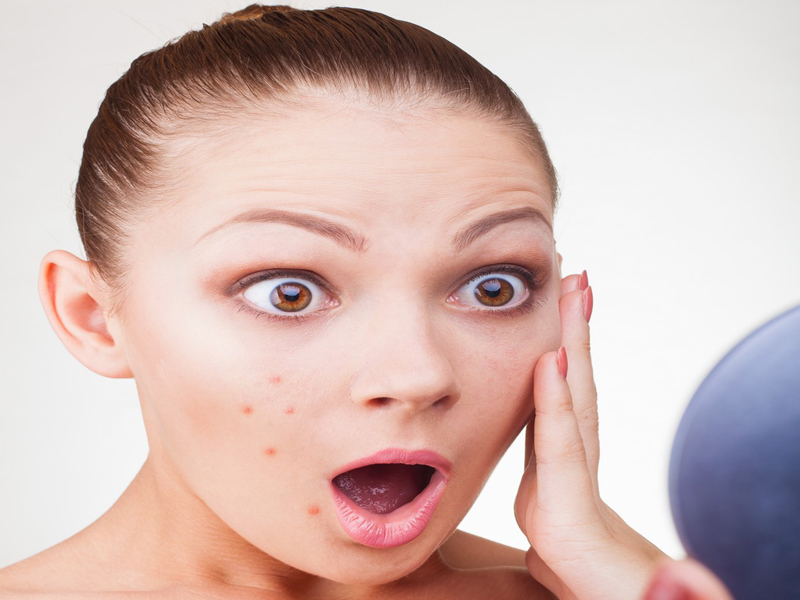 If you are willing to look your best then this is the thing for you. Choosing the right saree during the summers can be really tough. 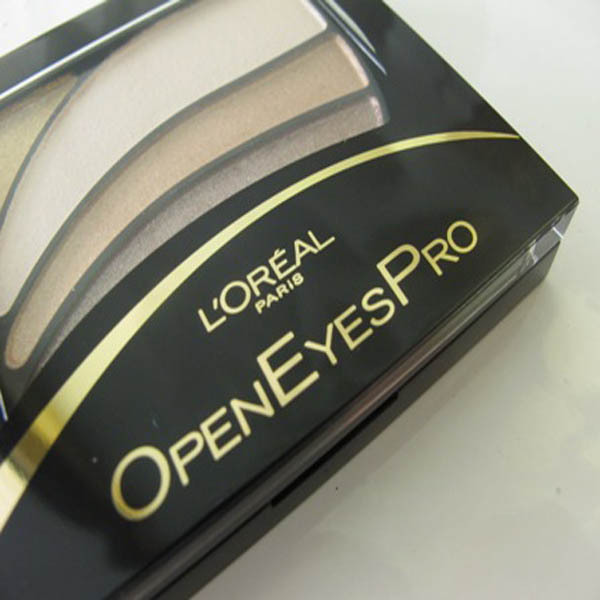 If you are sporting something totally alluring, then this might be one of the best stuff for you. The saree comes with a quite attractive traditional design on the Pallu and that is what impresses people in the first place. 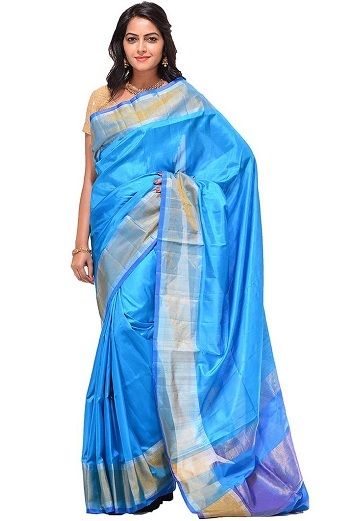 This Uppada sari is designed especially for women who like to make a style statement wherever they go. The beautiful combination of green and dual-toned pink comes with a rich golden zari border. It has golden zari running all over the saree in the form of checks. This is one of the best Uppada saris. 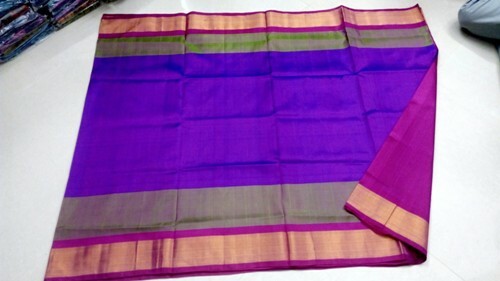 If you are looking for a simple, yet regal silk saree, check out this gorgeous violet Uppada plain saree. The unique feature about this saree is the long zari border that can make you stand out if the crowd. The saree also comes with a contrast pallu, which is also kept plain. This is best for religious occasions and festivals. This is one of the best Indian Uppada saris. The royal blue handloom Uppada saree is a head turner. It is extremely grand in its look and comes with a rich zari border. The saree also has plain design the body. Pair it with some heavy jewellery, you will surely make your presence felt. If you are looking for a slightly low priced version of Uppada sarees, check out this Uppada cotton saree. 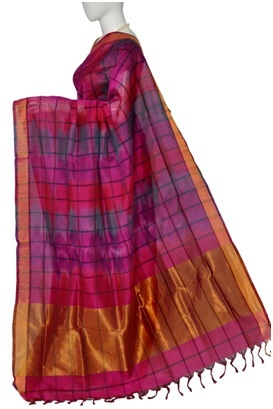 The multi-coloured pure Uppada cotton saree is a stunning piece. It has beautiful hues of pink and violet with a golden zari border. The unique part of this saree is the ikkat weave on the Pallu. This elegant Uppada Checks saree is perfect for parties and important occasions. 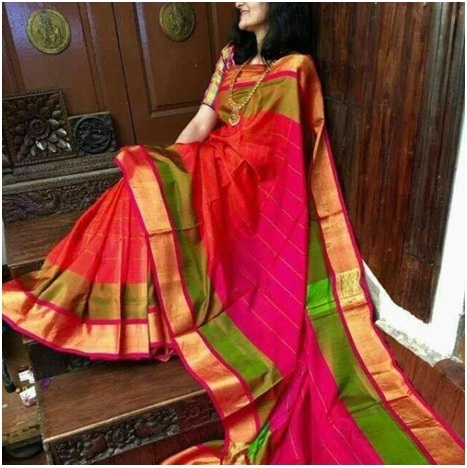 The lovely saree comes in a half and half model, where the bottom half of the saree is in bottle green and the top drape comes in a pink and orange checks. This is a pure handloom saree and is one of the different types of Uppada sarees available in the market. Pure Uppada sarees are usually very expensive, as they are painstakingly handmade on the looms. The quality of these sarees is matchless and can never be replaced by the mill produced sarees. If you are looking for the best quality Uppada saree for your wedding, it is recommended to shell extra money for that priceless look. Original Uppada sarees also have a long life and their zari remains shiny for many years. These sarees must always be dry-cleaned and aired atleast once in 6 months to prevent them from spoiling. We hope you liked this collection of Uppada sarees and plan to add one in your wardrobe. 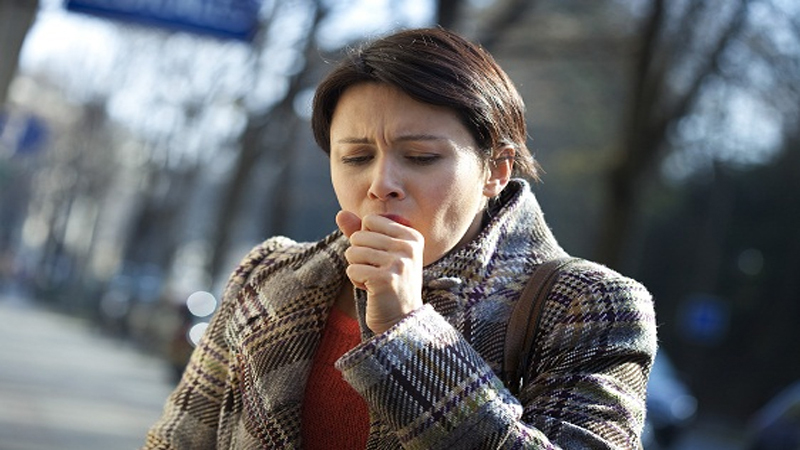 Signs and Effects of Dry Cough & How to Treat?